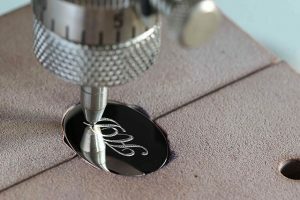 Badger & Brown are pleased to offer engraving and personalisation on most of our products. You can add dates, initials, names, loving or even quirky messages to create a unique gift that will be cherished for years. All engraving can be carried out the same day as ordering by our experienced engraving team, and we kindly ask an additional 24hrs for all photo and image cufflinks so they can set before dispatch. Our experienced team will carry out all works in a professional manner to ensure your item looks exquisite. If you’ve any special requirements and would like to alter the personalisation in any way from what is shown please contact us and we’ll accommodate. Our team of experienced engravers use traditional diamond tipped machine cutters with precision technology, creating a deep impression that retains its clarity indefinitely.